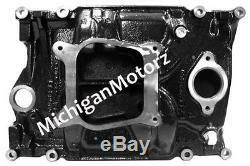 4.3L, 4 bbl Intake Manifold - (1996-Later) Brand new genuine GM Vortec 4.3L, 4 barrel intake manifold. Made of cast iron , this intake is easily identified by the 8 bolts required to bolt to the cylinder heads. (Previous generation 4.3L engines require 12 bolts). If you have a 1996-current, 4.3L MerCruiser, Volvo Penta, OMC, etc. Engine with a 4 barrel carburetor, then this is your EXACT intake manifold. Replace your 2 barrel intake manifold with this 4 barrel intake and 4 barrel carburetor for a 20 hp increase! Read our Feedback - We deliver what we advertise! The item "MerCruiser 4.3L 4 barrel Intake Manifold (1996-Later) with gaskets 824330T1" is in sale since Wednesday, May 25, 2016. This item is in the category "eBay Motors\Parts & Accessories\Boat Parts\Inboard Engines & Components\Intake & Fuel Systems". 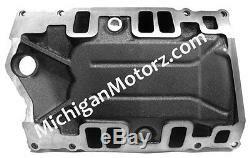 The seller is "michiganmotors" and is located in Madison Heights, Michigan. This item can be shipped worldwide.